Without much ado, Apple’s oldest piece of hardware has been quietly updated. And with that, all hope for a higher resolution display is gone. It almost seems as if Apple is making final preparations for the MacBook Air’s retirement rather than upgrading it from the bottom up. Most probably, this is due to their recent product strategy. Still, the Air is the most affordable path into Apple’s universe. At only $999, the MacBook Air with its 13.3-display (1440x900), 1.8 GHz dual-core processor, 8 GB of RAM, and a whopping 128 GB SSD is a true steal (this sentence may contain traces of irony). Unfortunately, at this price it does not include an IPS panel with decent viewing angles, and even lacks Apple’s Force Touch touchpad. It thus makes sense that Apple has refrained from making a public announcement of what can only be described as continued life support for its Air lineup. Kudos to Apple though, for keeping the Air around for yet another year, and thereby satisfying the still surprisingly high demand and, most importantly, managing to continue selling it at a high profit. Convincing people to purchase this particular notebook in 2017 is a feat that only Apple is capable of pulling off. We have picked the basic entry-level model for $999 for our test. It has only recently been bumped to 1.8 GHz and equipped with a faster 128 GB SSD, but is otherwise identical to its predecessor. 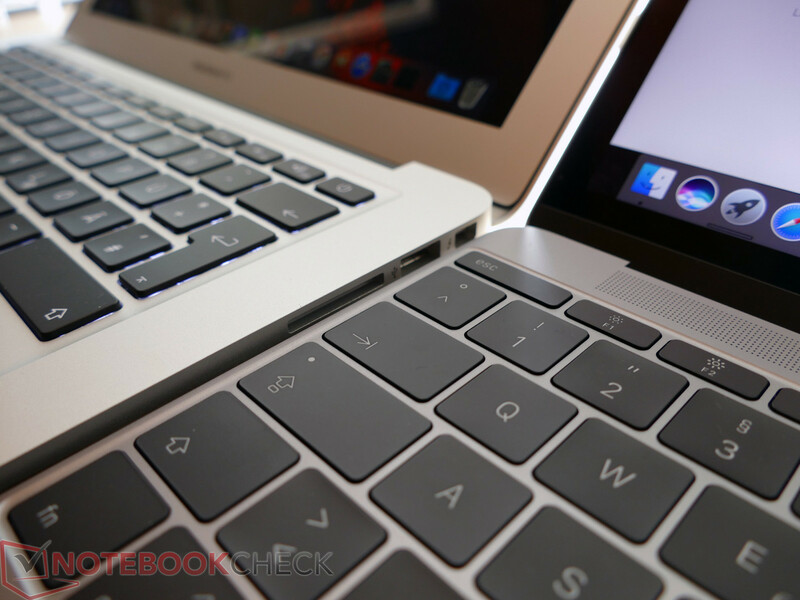 Thus, we will not discuss the case, connectivity, and its input devices in this review and would like to refer you to our MacBook Air 13 2015 review instead. We did, however, take another look at the display using our new measuring equipment, and whether the bump in performance also induced changes in emissions and battery life. Our size comparison clearly shows that in terms of size, we have seen massive improvements in the last seven years. Even the much more powerful MacBook Pro 13 has now become smaller and slimmer than the MacBook Air 13, and its weight is almost identical. In this price range, several Windows notebooks are also capable of beating the MacBook Air 13 hands down when it comes to size and thickness. Build quality and touch and feel are still top notch, though. Our size comparison clearly shows that in terms of size, we have seen massive improvements in the last seven years. Even the much more powerful MacBook Pro 13 has now become smaller and thinner than the MacBook Air 13, and its weight is almost identical. In this price range, several Windows notebooks are also capable of beating the MacBook Air 13 hands down when it comes to size and thickness. Build quality and touch and feel are still top notch, though. Since we were not testing integrated card readers back when we last reviewed the MacBook Air 13, we did it this time. Long story short: the Air achieved a transfer speed of 88 MB/s. Our Wi-Fi performance test is also new, and did not exist during our last review of the MacBook Air 13 back in 2015. In a standardized setup, we measure maximum transfer speeds both transmitting and receiving data. 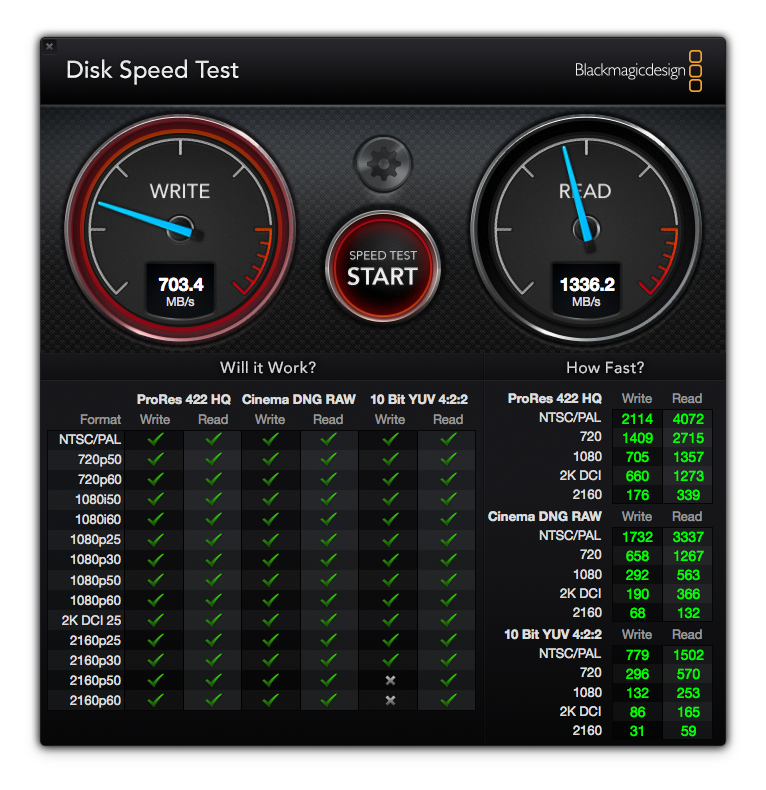 At 686 and 692 MB/s, respectively, the MacBook Air 13 performed exceptionally well in this test. 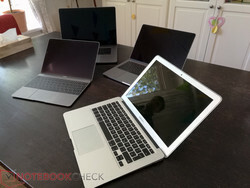 The more expensive MacBook 12 did not perform any better, only the much more expensive new MacBook Pro 13 managed to outperform the Air 13 by a significant margin. 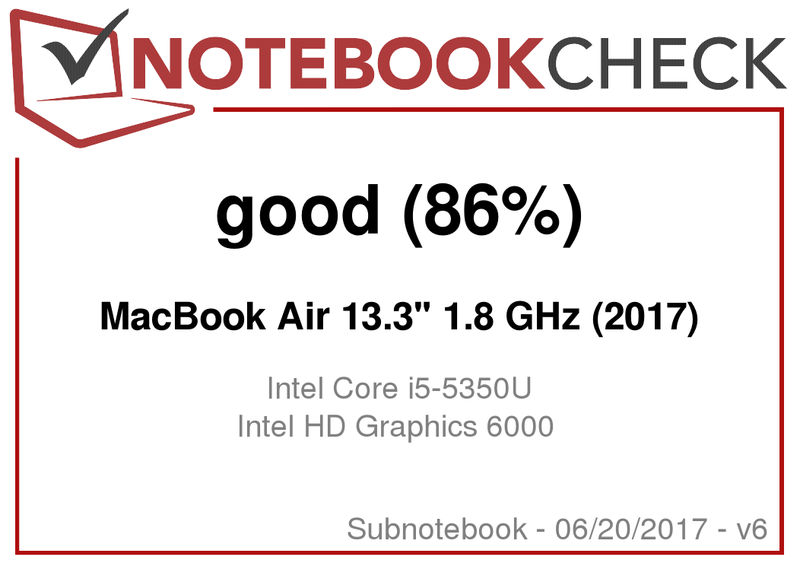 With several thick concrete walls between the notebook and the Wi-Fi router, the Air 13 performed just as well as the new MacBook Pro 15, with the MacBook 12 falling behind and the MacBook Pro 13 once again outperforming its competitors. Evidently, Apple is still equipping its Air with the well-known 13.3-inch TN panel with a highly reflective coating. At this size, its resolution of only 1440x900 translates to a pixel density 128 PPI, which is not only fairly low when compared to Apple’s own Retina displays, for example its 227 PPI 13-inch MacBook Pro, but also the 1920x1080 FHD panels that have become more common in the last few years. The comparison with the MacBook 12, with its 12-inch 2304x1440 resolution (226 PPI) display, makes it painfully obvious how outdated and terrible the Air’s display really is, and how crisp and clear a panel can be in 2017. This is most obvious when looking at text, where the Air’s lack of sharpness results in blurry shading along the edges. Thus, we would absolutely recommend a higher resolution display for those of you who work with and look at text all day long. 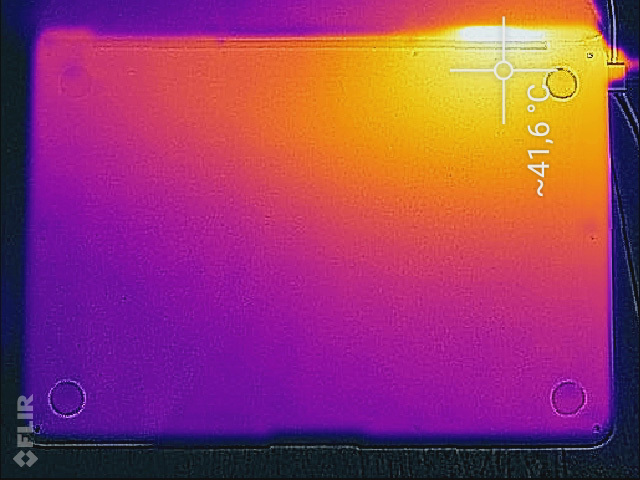 Since our new at-random brightness measurements did not deviate significantly from our previous ones, the following details are taken directly out of the MacBook Air 13 2015 review. When the MacBook Air was first introduced, TN panels were still quite common. Unfortunately, the latest iteration still features the exact same TN panel, which means significantly reduced viewing angles on the one hand, but also lower response times on the other. With our new measuring equipment, we have found the black-to-white response time to be 28.4 milliseconds, and grey-to-grey took only 52.4 milliseconds. Thus, the Air’s panel does not really stand out when compared to the MacBook 12’s much more modern IPS panel. 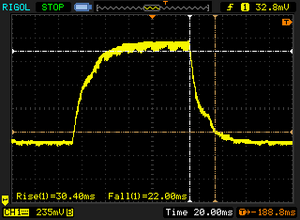 Thanks to our new equipment, we were also able to detect PWM flickering at reduced display brightness levels at a very high 58 kHz and hence, it should not be of any concern. 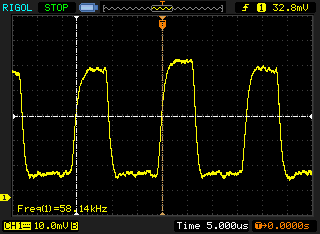 The display backlight flickers at 58000 Hz (Likely utilizing PWM) . 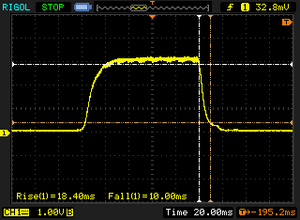 The frequency of 58000 Hz is quite high, so most users sensitive to PWM should not notice any flickering. These days, notebooks in the Air’s price range are usually equipped with IPS panels. The Air 13, however, is not. Thus, it suffers from significant color and brightness distortions that TN panels are famous for, and vertical viewing angles are very poor. Those of you who are used to either smartphone or notebook IPS panels will suffer immensely. Horizontal viewing angles are somewhat better. Combined with the highly reflective coating, the poor viewing angles make it very difficult to find an ideal display position and angle. Performance – Old, but Proven. Let us talk about the one aspect, where the new Air 13 has actually improved over the previous model. Apple still uses bottom shelf CPUs and continues to equip its Air with Intel’s Broadwell CPUs, and the i5-5250U (1.6 GHz) from the previous generation has been replaced with an i5-5350U (1.8 GHz). 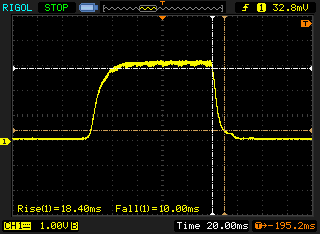 This translates to a “massive” 200 MHz, or 12.5%, performance bump! In terms of graphics card, the trusty Intel HD Graphics 6000 remains Apple’s flavor of the month. Taking a closer look at the benchmarks, we were surprised to see the new i5-equipped MacBook Air 2017 perform almost exactly as well as the Core i7 model from two years ago. 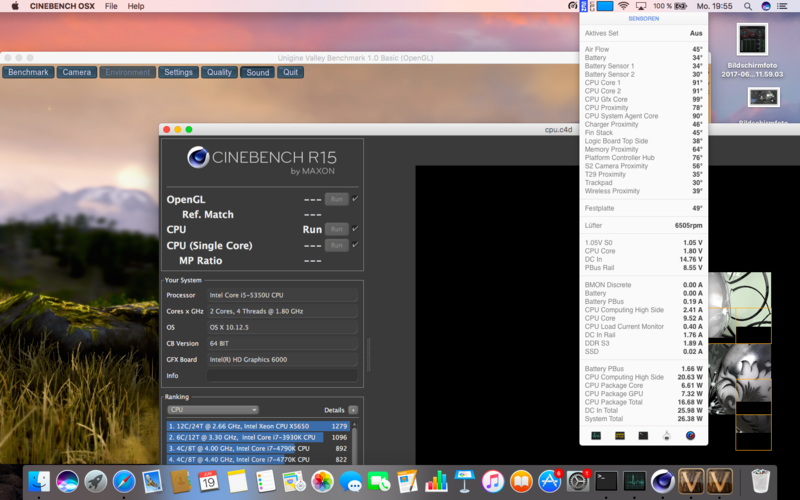 It scored 116 points in Cinebench single-core test (2015 i7: 112 points). Given that Apple is still offering the 2.2 GHz Core i7 processor for an extra $150, we suspect that the performance difference between the two models is, at this point, negligible. In the multi-core test, the Core i7-5650U model was slightly faster than our newer i5-model (296 vs. 277 points). Given the rather insignificant difference between the two, the optional i7 upgrade is most probably not worth the price. 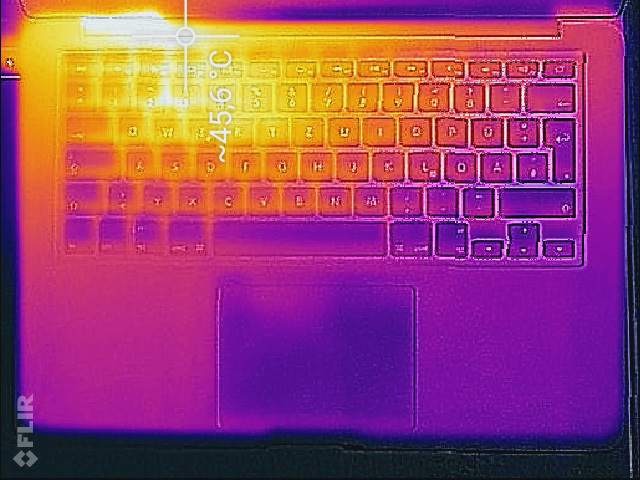 The fact, that Apple’s latest MacBook 12 with its passively cooled Core m3-7Y32 CPU performed almost as well in both tests was a surprise, to say the least. This, however, changed under sustained load, where the m3 began throttling after a while. Speaking of which, one of the essential aspects of perceived performance is not only how well a system performs under short bursts of load, but more importantly whether or not it is capable of maintaining that high level of performance for prolonged periods of time, for example when rendering a video. We simulate this by running Cinebench multi-core test in a loop for at least 30-minute, and our conclusion for the MacBook Air 2017 is that even after 20 reruns, the scores remained at their high initial level. Once again, in PCMark 8 the performance of the newer i5-equipped 2017 model was quite similar to the older, i7-equipped 2015 MacBook Air. 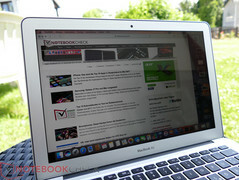 The MacBook 12 fell behind, and not surprisingly the much more expensive MacBook Pro performed better in this test. Subjectively speaking, the MacBook Air 13 is a highly portable internet machine most notable for its 16:10 display aspect ratio. Apple seeks to steer those who require more power, towards the MacBook Pro 13 that starts at $1299. 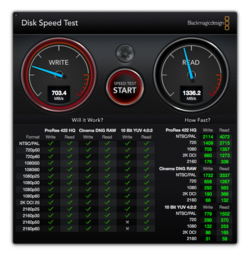 Sequential read speeds of the Air’s entry-level 128 GB SSD are only slightly lower than the MacBook Pro’s, however write performance is abysmal in comparison. It performed surprisingly well in the 4k tests, though. For a simple internet and office notebook, the 128 GB SSD should suffice. Or, rather, has to suffice, because the upgrade to the next tier SSD (256 GB) will set you back a whopping $200. A hefty price tag, given that a 500 GB Samsung 960 EVO SSD only costs $220, and outperforms Apple’s SSD to boot. Apples and Oranges though, because as we all know you cannot install an m.2 SSD in Apple’s laptops. Still, it serves to highlight Apple’s highly questionable upgrade policy and prices. 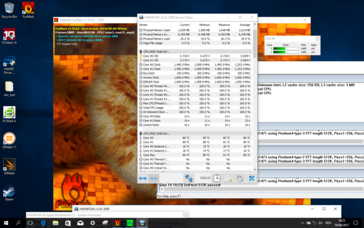 In order to determine the Air’s GPU performance, we have decided to run our regular 3DMark benchmarks under Windows via Bootcamp. We had to manually update Intel’s drivers prior to running the tests. Compared to the i7-powered 2015 Air, the new 2017 Air performed slightly better despite the fact that it still features the exact same GPU. Intel’s current Kaby Lake HD Graphics 620 was only slightly faster, and both got hammered by the Pro’s Iris Plus Graphics 650 GPU. The MacBook Pro 15 features a dedicated GPU, and therefore offers even more graphics power. Running some older PC games once again proved that the Air’s GPU performance has not really improved significantly over the last few years. Older Windows games will only run smoothly on the lowest details. The only halfway suitable gaming laptop made by Apple would be the MacBook Pro 15, with its dedicated Radeon Pro 555 GPU that performed about as well as a GTX 950M, and only slightly worse than the newer MX150 (GT 1030). All in all, these are still only mid-range GPUs, and do not stand a chance against a current gaming GPU, such as the GeForce GTX 1060. Apple and gaming – not a smart move. Apple and low system noise, on the other hand, go together very well. Using iStat Menus, we found the fan to be running at a low 1200 RPM when idle or under low to medium load. It was completely inaudible, though, and even our microphones failed to detect any noise. Running office applications and browsing the web is thus once again a completely silent experience. Only after prolonged periods of high load, such as running games, does the fan finally kick in. 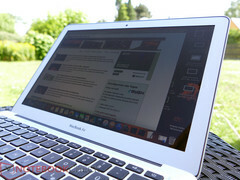 Overall, it remains very quiet, and when using the MacBook Air 13 as intended by Apple it remains completely silent. That said, we found absolutely no difference between the current and the 2015 model of the MacBook Air in terms of noise. The same was true for temperatures. We did not expect the newer model to behave any differently from the older one, and we were right. Under medium load, the case remained comfortably cool. 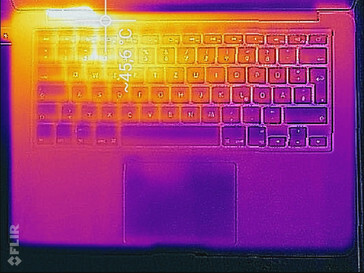 Only after a prolonged period of high load did it warm up significantly around the rear parts of the keyboard close to the hinges. Back in 2015, we were not testing a notebook’s speakers as thoroughly as we do today, and we can now finally make up for that. Unfortunately, when compared to the smaller MacBook 12, the Air did not perform very well. Mids and highs are much more pronounced on the MacBook 12, and so are lows (bass) to a lesser degree. Nevertheless, the speakers were not half bad and are okay for listening to music in mostly quiet environments. Its maximum noise level of 78 dB(A) places it mid-field among its competitors. Once again, the 2017 i5-model performed very similar to the previously tested 2015 i7-model. Not only has its extra 200 MHz bumped the performance, but also increased power consumption, which has made it ever so slightly less power efficient than the previous i7-model. It is feasible, however, that a more draconic selection process on Intel’s part is at least partly responsible for the i7’s slightly higher energy efficiency. We ran our real-world Wi-Fi test of at 150 nits display brightness with the 2017 model, and it lasted almost 20 minutes longer than its 2015 predecessor. Thus, you can expect to be able to browse the web for more than 10 consecutive hours, something the MacBook Pro 13 fails at, and even the MacBook 12 ran out of juice almost 100 minutes before the new MacBook Air. Verdict - Olden but Golden. 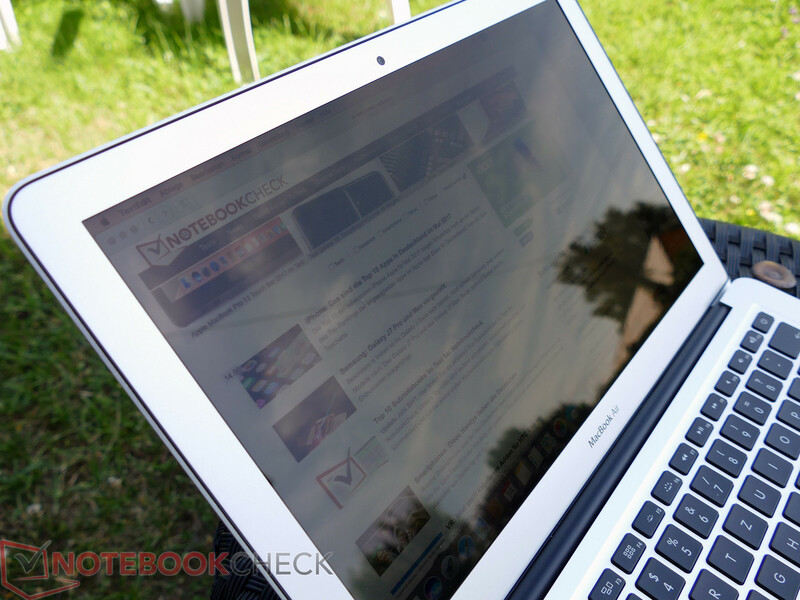 Years go by, yet the MacBook Air remains unchanged year after year after year. The most significant changes in notebook design of the last few years, such as higher display resolutions, thinner bezels, and larger displays in similarly sized cases, have all gone unnoticed by the Air. Accordingly, it did not surprise us that unlike the MacBook 12’s updates, Apple has decided to perform the Air’s updates on the quiet. Apparently, the MacBook Air is not deemed “presentable” anymore, and somehow it does not really fit into Apple’s current portfolio. The biggest issue we have with the new MacBook Air 13 is its display. With its low-resolution TN panel, it certainly feels very outdated overall. In 2017, our expectations of a $1000 notebook include an IPS panel with at least FHD resolution. Its price tag of $999 for the 128 GB base model is quite hefty, and the extra $200 that Apple charges for a 256 GB SSD instead is, quite frankly, daylight robbery. Nevertheless, even after all these years the Air’s basic concept still shines through all this gloom and dust. A very well-built and high-quality aluminum case combined with decent input devices; more than decent Wi-Fi performance; overall very good system performance that is well suited for its intended use scenarios; more than 10 hours of battery life; and last but not least a dead silent user experience. Even in 2017, all these aspects are worthy of praise.